A menacing specter is haunting Europe — the specter of unstoppable Muslim immigration. It frightens German Chancellor Angela Merkel; it demonstrates the inefficiency of the instruments of European power (Commission and the Council of Ministers); and it puts a spotlight on all those who have been crying out against Europe’s disastrous acquiescence to this policy (the leaders of former Eastern Bloc countries (the Visegrad group), Austria, and, most recently, Italy). For Mrs. Merkel the situation appears critical and may even be a matter of her political survival. To avoid the dead-end they’re heading toward, she is almost imploring the totally unreliable President Erdogan of Turkey to halt the flood of immigrants to Europe. She is also attempting to revive the provisions of the Dublin Regulation, the European treaty stipulating that illegal immigrants be returned to the country through which they first entered the EU. Obviously, this document is anathema to states like Italy and Greece (despite having approved it), since they are in danger of ending up with hundreds of thousands of immigrants on their hands. This is why an emergency summit meeting of European leaders was called in Paris on June 23 to deal with the issue, which primarily means exploring ways to salvage Mrs. Merkel's political fortunes. The unstoppable flood of so many people into Europe is no longer simply a humanitarian issue. It has almost become a serious geostrategic threat. The US clearly feels it; Russia recognizes the emerging new realities; and parts of Europe are waking up to this unsettling environment. Those who are ignoring the handwriting on the wall are either: a) deeply influenced by international financial leaders (i.e., George Soros), b) European idealists far removed from the situation on the ground (those surrounding the European Commission's President Junker), or c) politicians from countries that already have large Muslim populations (Britain, Sweden, Belgium, and Germany). The presence of a significant number of Muslim citizens signifies powerful electoral blocs that wield influence over the decisions that might lead to an unknown and deeply perilous future. In many of those societies there are already laws curtailing free speech that make any criticism of Islam, its principles, or values ("Islamophobia") illegal. Notwithstanding of course that slandering the Christian West, its attitudes, and morals can be done openly and without any legal restraints from the mullahs or other Islamic devotees. The situation is reminiscent of the Goths plundering the Roman empire in 380 AD. With the relevant analogies of course. Back then, they had originally been invited in to revive a thinly-populated countryside. But they then overran most of the land and ended up conquering Rome. Today the US is keeping a strategic distance, watching as events unfold. They are diverting their focus, casting it toward Russia and secretly cherishing the European mess. The world is changing and it appears that Europe is stuck with the mistakes made by Brussels and the German Chancellor. It is inevitable however that events will follow a different course. 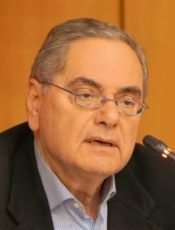 Andreas Andrianopoulos is a former minister in several Greek governments and nine-term member of the Greek parliament.